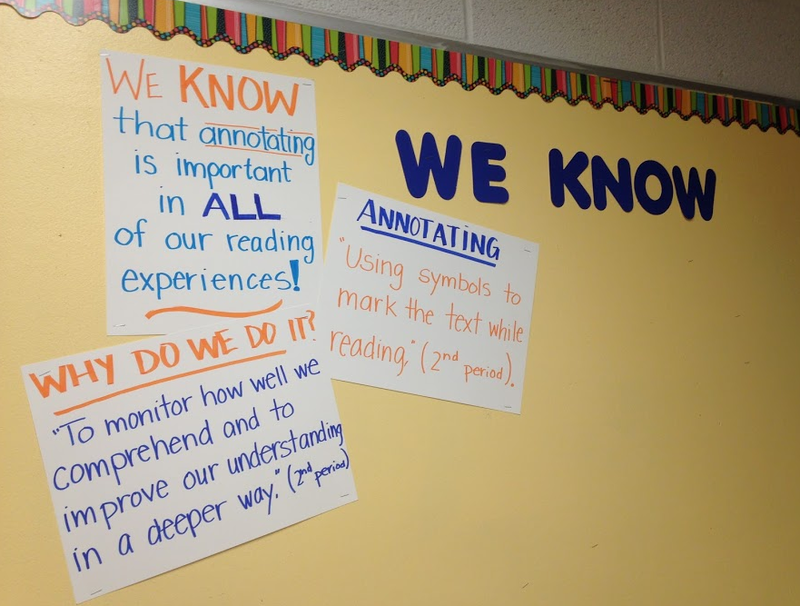 Week 4 Recap: Annotating, Subjects/Verbs, and I Wish My Teacher Knew…. So many great things are happening in my classroom, and I want to share them, but between golf and marching band, I can’t find the time. I decided to try to highlight some things that happened in my room this week, and perhaps I will post a little recap each week. Never mind there is no Week 1, Week 2, or Week 3….. I’m officially starting with Week 4. 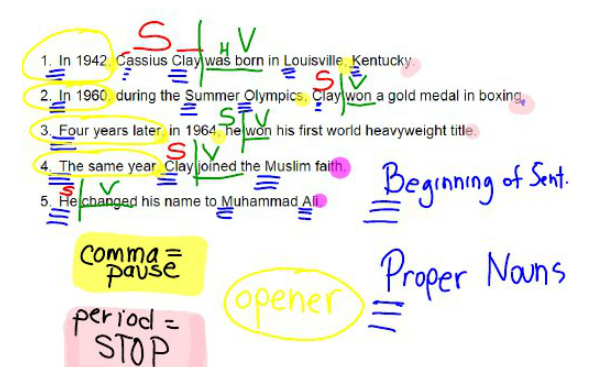 We have been working hard on annotating the short informational texts we are reading in class. These text selections from Newsela and Readworks are building background knowledge for the novel we will be reading in October, Fish by L.S. Matthews. By the end of Week 4, my 8th graders came up with the following for our WE KNOW bulletin board. The premise behind this bulletin board is where I want to post some really big concepts that can be applied to all parts of school, and beyond. I let them decide on the wording because I wanted them to “own it.” Students copied the final wording in an Annotating Foldable. 1. Don’t go highlighter crazy! 2. If you highlight, you must write! My 7th grade is working on identifying subjects and verbs, while 8th grade is finding subject, simple predicate and complete predicate. I continue to use Mentor Sentences to teach these concepts. Again, I used the reading from readworks.org to make short simple sentences for the 7th grade. I used sentences from an article we read on Newsela for the 8th graders. Before I forget, did you know that Kahoot! now has “Public Kahoots.” Maybe they always have, but I didn’t know it until this week when I was getting ready to make my own subject/verb Kahoot. What a relief when I found something that worked perfectly!! My students had a lot of fun reviewing for their quiz with this particular Subject & Predicate Kahoot someone else made!! Obviously, you can guess what I had my students do. I asked every student to write me a 6-8 sentence paragraph in their Writing Notebooks using that prompt: “I wish my teacher knew….” My heart melted and ached as I read some of their responses. I did not expect to get such honest responses, and I learned so much about my students. I spent the next two evenings writing a half to full-page response back to each of them. It was a simple activity I recommended to all of my teacher friends. So there are the highlights of Week 4. If there is anything you are specifically wanting to know more about, leave me a note in the comments. Hopefully I’ll be able to post again at the end of Week 5! I love the annotation quiz! I’m getting ready to use lessons from the book Text & Lessons. 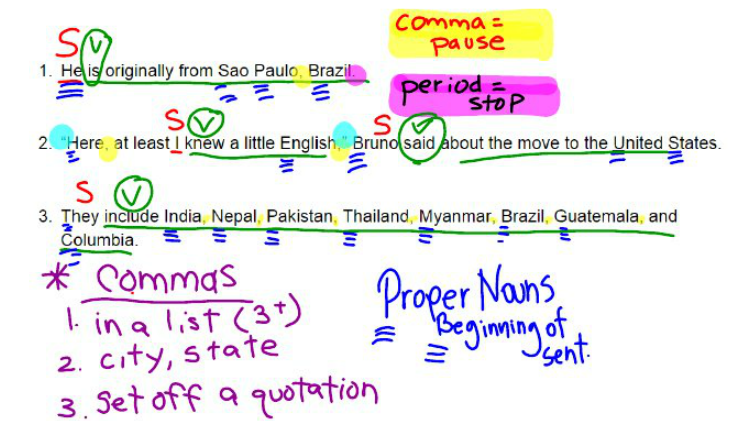 I use the non-fiction book and do several lessons on text marking (symbols, pictures, etc.). I cannot find my annotation guide in my google docs. I think I may have trashed it! It’s very simple. Star for important things, box for keywords, circle for unfamiliar words, exclamation point for surprises, question mark for unclear text.